Escape the modern world and travel to a land of fantasy with The Search for the Lightbulb Burglar. David Habben's illustrations follow the journey of the lightbulb explorers through their steampunk world. Steampunk is a genre of fantasy/science fiction that reimagines Victorian era designs with modern technology, often through the use of steam. It spans from literature (Jules Verne; H.G. Wells) to fashion, music, lifestyle, etc. The style of the characters with lightbulbs on their heads can be seen as steampunk in style, with the goggles, Victorian-esque clothing, gears and backpack apparatus. 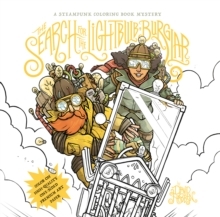 David takes readers to an exciting and inspiring fantasy world where the lightbulb explorers are on a journey to rescue a rare lightbulb from an evil collector, complete with gears and airships, often seen as hallmarks of the steampunk style. 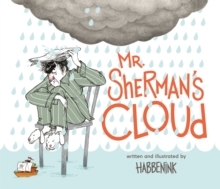 This colouring book is unique because it not only provides a topic that has not been used in the colouring book world, but it also tells a story. It features 50 unique illustrations and gold foil on the front cover.